Hellenic culture, of course, has a unique relationship with Germany. The Greek-American comedian Yannis Pappas, whose alter-ego Mr Panos parodies the “lazy Greek” stereotype, responded to the ECB’s move withan instant video blog. With cruel humour, it evoked the high death toll among German paratroopers landing on Crete in 1941. And it went viral. The subtext understood by many Greeks was: you were once Nazis, we fought and beat you, you have no moral right to push our country into chaos. It must have been tough for the Germans to hear – but they’ll be hearing an even tougher message should their politicians succeed in ejecting Greece from the euro. For Germany’s unwillingness to lead Europe is the old problem. The new problem is Germany’s demonstrable willingness to break up Europe. Pleas for the continent’s largest economy to expand state spending are met with theschwarze null policy: 0% budget deficits, imposed by law. Brazen acts of proxy warfare by the Kremlin are met with diplomatic dithering. The sight, on top of that, of large anti-Muslim demonstrations in this, the richest and most politically stable country in Europe, is now reviving hostility towards Germany way beyond Greece. As a child in the 1960s, I swapped bubblegum cards showing the depredations of the SS and the Luftwaffe’s dastardly behaviour at Dunkirk. But, being trained in classical music, I was also lucky to be exposed to the best of German culture: to Beethoven, Mozart, Bach, Brahms. So, when I say what follows, it is not out of hostility or ignorance. Germany is eating itself over Greece. It is eroding its moral authority, and seems prepared to destroy the eurozone’s integrity just to make a point. As long as the Greeks obeyed the troika, they could be cast as the stereotypes on which Mr Panos plays: foul-mouthed, lazy Mediterraneans, addicted to a welfare system they cannot afford, which is the subtext of magazines such as Bild. By voting for Syriza, the Greeks have challenged the stereotype. Prime minister Alexis Tsipras is exactly the kind of guy you find in German business meetings; a polyglot with a polite smile and no tie. Varoufakis, if you took away his Greek passport and gave him a better suit, could be a German technocrat from central casting. 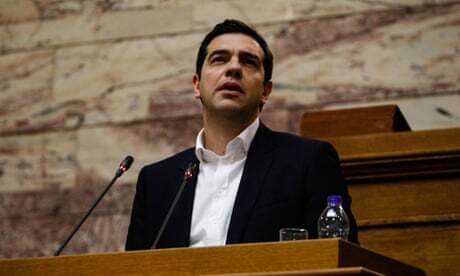 Against the Greeks, suddenly it is German politicians who look old, condescending, out of touch. While various Anglo-Saxon politicians have tried to foster positive relations with Tsipras – New York Mayor Bill de Blasio going publicly tie-less in his congratulation call after the election – the German political class has not. Meanwhile, the German press has concentrated on disparaging the new Greek leaders, suggesting they are, among other things, antisemitic. In that context, it was welcome that Syriza’s most senior female politician, Rena Dourou, used a Holocaust memorial speech last week to make an eloquent attack on modern antisemitism. Greece may be near-insolvent, its pensioners huddled over wood stoves in freezing flats without electricity, but – says Syriza – it stakes a superior claim than Germany when it comes to the creation of Europe and modernity. It may be at the bottom of the economic pecking order, but Europe was supposed to be more than an economy. Greece, like Germany, is a strong, visceral state of mind. If nations were measured by the salience of their culture – its bite, its saltiness, its addiction to beauty – Hellenic culture would stand equal to its Teutonic counterpart. And that is what makes the economic clash of will so visceral, too. What’s about to happen is a fight to the death. Either Germany drives Greece to insolvency, and out of the eurozone, or the German taxpayer signs up to an outcome that flies in the face of the rules-based mentality at the heart of German culture. Germany needs to handle this carefully; the rest of Europe is watching. My pals and I from the bubblegum card era were brought up in a country that had not seen occupation or fascism or genocide. Greece saw all of these, and Syriza’s victory has opened a floodgate of discussions about the past at Greek dinner tables. The popular Greek response to the ECB’s move last week is in danger of taking on the character of national revolt: a replay of the Battle of Crete, where the Greeks lose physically but win morally, at irreparable cost to the attacker. That imagery like this is being thrown around in modern Europe is a testimony to how badly modern Europe is failing.